So what about the story? Because as it was said to me on Twitter, “Alan Rickman could read the phonebook and I’d listen.” Well, it was wonderful! 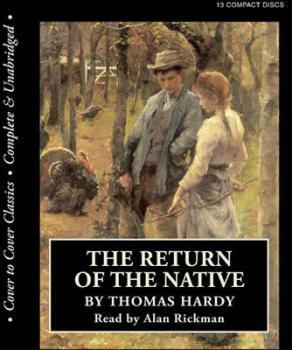 The Return of the Native would be painfully difficult to sum up in general terms. It’s like an 1800s soap opera on Egdon Heath. The best part about it, though, was the distinct lack of 125-page landscape descriptions! Sure, Hardy describes the world around these characters from time to time, but it’s never too much. Never so much that I wanted to fast forward. And the descriptions – particularly read aloud in such a beautiful voice – were evocative and refreshing. I loved it. To tell you more about the book itself, I’ll need to break it down into the players. There are five main characters in Return of the Native: three men and two women. Clym Yeobright, aka The Dreamer: Clym is arguably the primary character in the book, even though he doesn’t arrive on scene until at least a quarter of the way through this chunkster. He is the “Native” from the title, returning to Egdon Heath from Paris, where he sold luxury trinkets. He is frustrated with his lot in life, wanting to do something more idealistic, for the good of mankind and in particular for the poor rural folk. Love interest(s): In former days, his cousin Thomasin. After returning from Paris, Eustacia Vye. Damon Wildeve, aka The Scoundrel: Mr. Wildeve is a cad, toying with the affections of two different women in order to try to get the most benefit to himself. He runs the local inn/pub. He is a slave to his pride. Love interest(s): Primarily Eustacia Vye, though he has a passing affair with Thomasin Yeobright which eventually causes him to propose marriage (because her aunt doesn’t like him, which hurts his pride). It gets him in quite a difficult situation. Diggory Venn, aka The Gentleman: Diggory, a reddleman by trade, is the steadfast, loyal man of the trio, down to earth and hardworking. He has a solid sense of self-irony, and is honest, brave, and selfless. He travels for his profession, and always ends up in Egdon Heath whenever wrongs need to be set right. Love interest(s): He carries an undying passionate love for Thomasin Yeobright, even years after she’s rejected him. Thomasin (Tamsin) Yeobright, aka The Angel: Thomasin is the very epitome of innocence, naivety, kindness, and childlike foolishness. Everything she does and feels is young, immature, and easily taken for granted. No matter how much evil she’s exposed to, she is never corrupted. Love interest(s): Despite offers of marriage from both her cousin Clym and Mr. Venn years prior to the beginning of the book, Thomasin does not know love until she meets Mr. Wildeve. Eustacia Vye, aka The Demon: Descended from upper class and now forced to live on the Heath with her backward grandfather, Eustacia is passionate, wild, arrogant, contemptuous, lustful, and greedy. She hungers for a life better than the one she has now. She wants nothing more than to escape her current life, as long as that escape doesn’t involve any sort of work on her part. Love interest(s): Herself. In a partner, she favors Mr. Wildeve at first, then later transfers those leanings onto Clym when he can give her something more to her advantage. The rest of the cast is filled out by Mrs. Yeobright, whose parenting skills towards Clym and Thomasin are contrasted by those of Captain Vye, Eustacia’s grandfather. There are also a handful of comic relief characters scattered around the Heath. The biggest thing I got out of this book was that you should marry not the person you love, but the person who treats you the best (Go for Diggery Venn! Really! You’ll be happier if you do!!)! This is particularly the case for the women, who in that time really had nothing they could do for their own lot in life and depended heavily on their husbands. Going into marriage with contrary opinions or when your future spouse’s affections aren’t always true is a BAD IDEA. I suppose, perhaps, that in some ways, it’s a lesson people still learn today – that strong, passionate love in the beginning does not necessarily lead to lifelong compatibility. Captain Vye certainly didn’t have a lot of foresight. Once Eustacia was under his care, he never bothered with her. He didn’t try to direct her behavior or have a hand in her upbringing, but instead let her run wild on the Heath. Eustacia, consequently, never has much direction in her life and must make her own way the only way she knows how. Eustacia herself is a fascinating character. Despite what I said above in describing her, there were parts of me that sympathized with her. She was trapped by her situation and upbringing. While she certainly could have made better decisions, I understood why she manipulated things the way she did. She was always trying to find the most advantageous path to take, while keeping other doors open in case something didn’t work out. This sort of manipulative scheming is awful, but how many of us haven’t done something like that? Trying to figure out the best way to go by taking a couple steps down each road? I both disliked and loved Eustacia. Happily, the end of this book was not the utter depressing misery that ended Tess. Of course, there is some share of tragedy. You must expect that from Hardy. But the end is mixed, with good and bad, and it left me completely satisfied in all respects. I loved this book. And I loved listening to Alan Rickman read it to me over the course of 5 weeks. It was a perfect experience altogether! Note: This book was reread and re-reviewed in January 2019. This entry was posted in 2010, Adult, Prose and tagged audio, classics, favorite, gender studies, memorable. Bookmark the permalink.